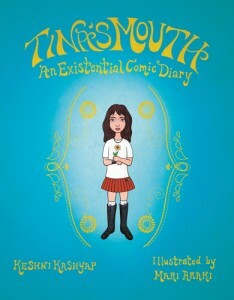 Tina’s Mouth: An Existential Comic Diary is the story of 15-year-old Tina M., an Indian-American girl attending a posh private high school in California, and, like so many her age, trying to find her place in the world. A natural for self-reflection, Tina’s ripe for existentialism when her hippie English teacher introduces the subject to the class. The assignment for the year is for each student to find “true and authentic meaning and purpose” in their existence. What follows is Tina’s project. As the subtitle suggests, her search is in the form of an existential comic diary. For anyone who was the slightest bit broody in high school, Tina is a relatable character, and, without question, a likable one. She’s everyone who has ever felt out of place, who has ever wondered if they’ll ever feel normal, and, of course, if they’ll ever find someone who understands them — friend or otherwise. Keshni Kashyap, author and filmmaker, and illustrator Mari Araki met through a mutual acquaintance and formed an admiration for each other’s work. Together they worked long hours and, as some of the story has autobiographical elements, Mari was introduced to the Kashyap family and shown around the high school that served as a model for Tina’s. The two were kind enough to answer a few questions about philosophy, storytelling, and the collaborative process. You can find out more about them and their work at keshnikashyap.com and mariaraki.com and you can order Tina’s Mouth through the site Tinasmouth.com. Did you always know Tina’s Mouth would be a graphic novel? Keshni: Yes. I started working on it as a side project, and it was always meant to be a graphic novel. I have a filmmaking background, so this distinction is important to me. How did the storytelling process differ from filmmaking? Keshni: Because I had a ‘diary,’ I was able to do some different sorts of things. Use the images to make certain ideas bigger or more effective (the mouth, for example) or funny or contrapuntal. I could also make a visual story feel more novelistic. I’m not sure if I succeeded, but that was my intention. In filmmaking, you really have to be careful. Voiceovers are very hard to pull off. There are also a variety of other reasons that make being experimental tricky. Producers, for example. And crews of people. With Tina’s Mouth, it was always just me and Mari. What was the collaborative experience like? Keshni: It was a lot of fun – my favorite part of the whole process. Was it important for you to have a female illustrator? Keshni: Initially no. But, looking back, I’m so glad it was! I found the illustrations and text well balanced and the art to be a nice fit with the tone of the story. Mari, how would you describe your style? Mari: While developing my style, I never really thought about what genre or label of artwork I was creating, but some curators have said I fit into the “pop-surrealist” category so I suppose that’s how most will identify my artwork. However, I prefer just to be thought of as an artist. This way I have no unnecessary, self-imposed boundaries to my work. What was your favorite part of illustrating Tina’s Mouth? Mari: The beginning, when Keshni and I were creating the characters, and also the party scene where Tina kisses Neil for the 2nd time. This is Keshni’s story yet you play a large role in telling it. What about yourself did you bring to Tina’s Mouth? Mari: I added a few touches here and there into the drawings. We had so much fun working together. My intention was to communicate Keshni’s voice while adding some subtle twists, humorous notes and a bit of fun as well. I hope that comes across to the readers. What made you decide to work on this project? Mari: I loved the story, and I also had a bond with Keshni. I’ve been in love with Indian culture and its art, so I was excited to work on this project. Keshni, this is your story, but illustrations are equally important in telling it. Do you have any tips to fellow writers looking to work with an illustrator? Keshni: Words of advice for collaboration would be find someone whose work you deeply, inexplicably connect to, and make sure you can sit in a room with them for many, many long hours. You mention in your acknowledgments that you were introduced to the writings of existentialism at the age of fifteen. How was Sartre presented to you and what was your initial reaction? Why do you think you were ready for Sartre — and existentialism in general? Were you a misfit? A seeker? Keshni: Existentialism is notoriously difficult to summarize and I am in absolutely no way, shape or form an expert. However, the one idea that by and large lies at its core is that the individual creates meaning and value for his or her life through action. Sartre was very concerned with taking action and thereby imbuing one’s life with meaning. His theories also imply that society will work against you in this endeavor. This combination of self-determination and ‘raging against the machine’ appeal very strongly, as you can imagine, to a fifteen-year-old. Certainly shy, cerebral types who were kind of misfits — and, yes, I was definitely a bit of a misfit. Do you still find existentialism appealing and relevant? Keshni: I do in the sense that searching for your authentic self is very difficult in this day and age and what Sartre wrote about made a lot of sense. We live in a society that is very different from France in the 1940s. I’m sure it was chaotic in its own way, but they certainly didn’t live in an environment that had such a high level of religious, cultural, and lifestyle diversity and environmental peril. So the questions he posed arguably have more relevance in this day and age. Keshni: I love the way Sartre wrote about self-deception – a topic that is particularly relevant in an era where self-promotion is akin to eating breakfast – you do it every day with Twitter, Facebook, 24 hour news cycle, etc. I think to search for and adhere to your authentic self creates better societies and that is hard to do in a world that celebrates celebrity itself. What are some misconceptions about existentialism? Keshni: Well, from my perspective, the biggest misconception is that the whole world is bleak and there’s no point to anything so just stop trying and smoke pot all day. Sartre was actually very optimistic about life and its possibilities. Yes, life is bleak and difficult, but it’s also got a lot of potential and it’s your job as a human being to be very very true to who you really are. Don’t live the way you want the world to see you, but how you really are. Tina has an innate desire to delve deeper into life’s meaning. Do you share this trait with her? Keshni: I guess I’m drawn to spirituality and a spiritual life. I have a relatively serious yoga practice and a sort of serious meditation practice. Like Tina, though, I was raised in a very secular family. And to be honest, I’m also quite shallow and very much live in the modern world. What about writing from Tina’s point of view appealed to you? Keshni: What drew me to Tina was that I was interested in exploring the voice of a fifteen-year-old girl who has way more than the average fifteen-year-old girl, but feels quite alone and apart in the world. At this point in your life, who would you write journal entries to and why? Keshni: Oh, this is such a great question! Believe it or not, I’ve been keeping a journal to Henry Miller! No, it’s not naughty or anything like that. It started because I love the places he loved – Big Sur, Brooklyn, Los Angeles, Paris. I always loved his writing and observations and his anarchist tendencies and the way he broke literary form! But, I also found him to be sexist and reprehensible in many ways. So, in my journal, I tell him that. What are you two working on now? Keshni: I’m working on a young adult novel and two film scripts. Mari and I also have a smaller project we’re working on. Mari: I’m currently working on freelance illustration projects and private commissions. I’m also looking forward to doing another book illustration project. They’re hard work, but the end product is just so satisfying for me. GABRIELLE GANTZ is an incurable book pusher. When she’s not reading, or forcing others to, she’s listening to an inordinate amount of podcasts, taking pictures of weird things that cross her path, and drinking obscene amounts of coffee. She writes about art & culture at The Contextual Life and can be found on Twitter at @contextual_life. Gabrielle, another great interview. This book seems so compelling. And I loved the observations about self-deception. Thanks!